Brah let the Church say?! Let the Church say rapper Lil B need his behind whip in the name of Jeezus... Really this Child really went on these folks show dress as a Church lady straight with the throwback 'Good Time' TV show hat.... Whoa Gawd we are completely done with this Child. HA! Watch Brah in his church lady set up inside. 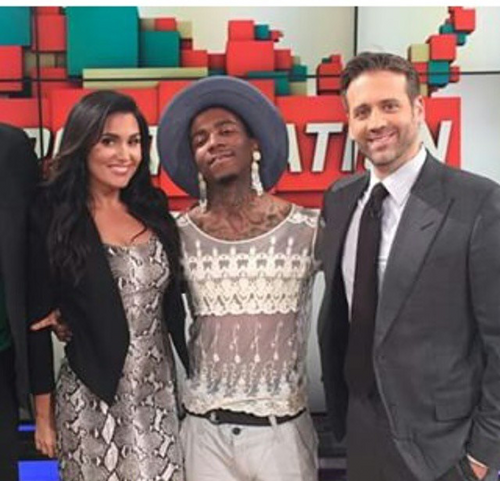 Lil B, who might be the most famous troll in modern times, sat with SportsNation hosts to play a game of “Cursed Or Not Cursed,” complete with some spooky music to set the mood. The 25-year-old Berkely native was asked about the first of his infamous curses, the one he inflicted on Kevin Durant. Lil Boss, as he’s also known, said that the Durant curse is currently active. It appears the Based God is keeping the curse alive as Durant reneged on playing a game of one-on-one. The segment continues with the hosts asking about others who have been hit with the curse, including Houston Rockets standout James Harden and Cleveland Cavaliers hero, LeBron James. Fans of Lil B won’t be shocked by his outfit, as he’s worn women’s earrings and hats in some of his past videos. A prolific artist, the Based God has 12 studio albums, 48 mixtapes, a pair of instrumental albums, and dozens of music videos.